Bank stocks and ETFs may be up for struggles this year thanks to a low-rate environment stemming from a dovish Fed, but other revenue opportunities are opening up for the segment apart from net interest margin gains. 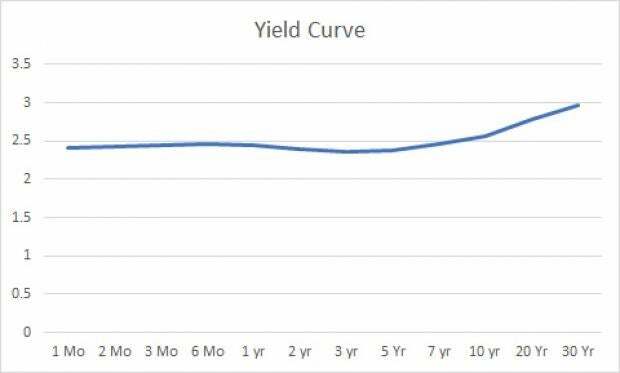 On Apr 12, yields for the two-year, three-year and five-year U.S. treasuries fell below the six-month duration yield, causing an inversion in the intermediate part. This flattening if the yield curve may weigh on banks’ profitability. Investors should note that income from IPO underwriting should help banks this year. The year 2019 is going to be flooded with unicorn IPOs. After a lull in the phase of government shutdown, the U.S. IPO market heated up with the tech unicorn IPO of Lyft LYFT in late March. Lyft raised $2.34 billion in its IPO (read: U.S. IPO Market Buzzing Hot: ETFs to Tap the Boom). In the past three weeks, 15 companies raised more than $5.5 billion in IPOs on U.S. exchanges, more than three times the total raised by 22 companies in the first 11 weeks of the year, according to data compiled by Bloomberg. The coming months should see other unicorns — private companies valued at more than $1 billion — like Uber Technologies Inc., Pinterest Inc. and Zoom Video Communications Inc. to enter the public market. Uber is eyeing to raise roughly $10 billion (read: Get Over Lyft Flop, Tap Uber IPO Euphoria With These ETFs). Apart from the tech startups, Levi Strauss & Co. LEVI shares hit the market in March, having raised about $623 million. Bank-backed Tradeweb Markets Inc. TW crossed $1 billion in its IPO on April 3. Others planning on going public include Slack Technologies Inc., Postmates Inc., Palantir Technologies Inc. and Airbnb Inc.
A surge in IPOs will bolster the activity of investment banks. Morgan Stanley MS and Goldman Sachs GS are to serve the top banking roles on the upcoming Uber IPO. The duo could reportedly raise up to $100 million for the ride-hailing company, while other banks will also work in the process. For Lyft, underwriters were JPMorgan JPM, Credit Suisse, Jefferies, UBS, Stifel, Nicolaus & Co., RBC Capital Markets and KeyBanc Capital Markets. The FT reports that “Pinterest has hired Goldman Sachs and JPMorgan Chase to advise” it on its impending public offering. Investment Banking Revenue to Grow? Along with other analysts, we also believe banks’ earnings are going to benefit from higher income from their investment banking division, J.P. Morgan has come up with its first-quarter earnings. And its gross Investment Banking revenue was $818 million, up 44%. We expect investment banking revenues to get bigger for Morgan Stanley and Goldman Sachs for the second quarter. Goldman and Morgan Stanley are heavy on iShares U.S. Broker-Dealers & Securities Exchanges ETF IAI. Investors can also have an eye on iShares U.S. Financial Services ETF IYG, iShares US Financials ETF IYF, Invesco KBW Bank ETF KBWB, Financial Select Sector SPDR XLF and Vanguard Financials ETF VFH to the aforementioned stocks (see all Financial ETFs here). Previous articleShould You Avoid IBM ETFs Ahead of Q1 Earnings?